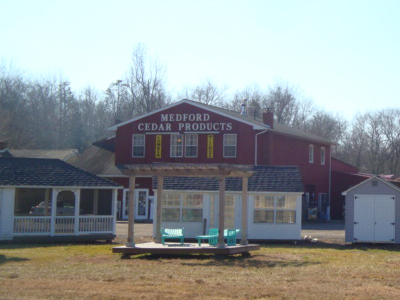 Founded in 1987 by Albin “Chip” Scheibner, Medford Cedar is family owned business that has served southern New Jersey extensively while having dealt from as far South as the Carolinas to north as Connecticut. Starting off as a custom-structure fabrication center, we now specialize in dimensional lumber and finished goods while still offering the same high quality in custom structures. Our structures have been displayed as centerpieces in the Philadelphia Home and Garden Show multiple times and have appeared in various other presentations throughout the company’s history. We invite the 2014 season, having increased storage units 400%, with a focus concentrating on Azek, Maibec, and Waska AWC Shingles, Diamond Decking, Pre-Grooved Ipe, primed clear vertical grain cedar trim, along with a multitude of other products. Feel free to call with any questions not addressed in the website.